Now - overdue - let's look at the effect of cascading generic 3-pin regulators. The common wisdom is that cascading series regs means you just add up the individual contributions for a glorious total that's easy to achieve, because the performance of each reg just adds up, right? Well, not quite. In a series cascade of regulation, the second reg is fed a near-constant voltage, and tries to maintain a near-constant output voltage, but the two are not related. Consequently there's are small error term between its own input and its output which depend on both load and line(supply)-related activity. Meanwhile the incoming noise rejection performance we looked at in part two is no better, and the noise contribution from each reg in series adds up , more or less. 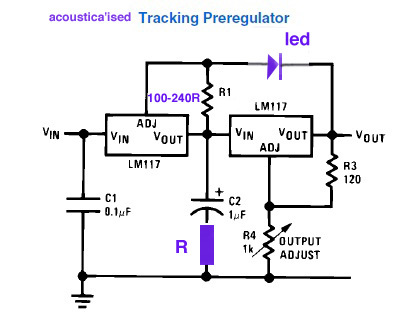 Look at how the tracking -pre-regulator works: it does *not* fed the second reg with a voltage regulated relative to input ground. Instead it maintains a contant voltage across the second regulator. Which is a subtle but important improvement: the second reg has a constant voltage across it, so the error amp inside it is ONLY dealing with load regulation. The line regulation issue - dealing with incoming noise - is solely the job of the first regulator. That's a very different case to the series cascade, where both regs have to deal with line. And the improvement can be audible in my experience. The datasheet supplies the diagram, but doesn't explain it at all, which is a shame because there is a hidden wrinkle to iron-out if the TPR is to perform optimally. First: if adding a cap across R2 helps the ordinary 317, why is none shown for the input reg here? Can we add one and make it work? This simple addition really helps and I'd recommend it in even the most basic TPR implementation, whether or not you add 'C3'. As to typical values ror C2 = Polyester 0.1uF in series with R5= 10ohms, or C2=1uF in series with R5=2R7 - 3R3; or a cheap 10uF electrolytic cap all work well here. Do not use fancy boutique low-esr caps on their own! There, we've got rid of a cap and a resistor by using a cheap red or green LED drops c.2.8-3v across reg2, which absolutely minimises noise from the first reg because the led at 5-10ma has a dynamic impedance under 30ohms. The added resistor still critically-damps the input to the second reg, stopping any spurious oscillation due to high loop gain / layout strays. And of course you can play with zeners and added caps etc in palce of R4on the second reg as described previously. So - a composite regulator with about 100dB of line rejection, a separate reg which essentially only deals with load rejection, 1.5A output capacity, short-circuit protection built-in, and it only costs pennies and requires about 5volts of 'headroom'. If you just want a quick and dirty implementation and can spare more voltage overhead you can use regular 3pin regs like the 7805 for the first reg, and just omit R1 and R2 altogether. A circuit well worth playing with for the very low cost of entry!